One of the more mysterious tracks in Beck's catalog, ".000.000" is a difficult, intriguing recording. The song was recorded as b-side for "Devils Haircut," in the Beastie Boys studio. I have a feeling that the indecipherability of the lyrics are part of the art of the song, however, and we'll never know for certain what the words are. 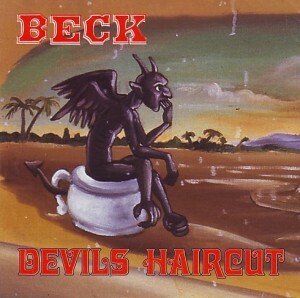 Rolling Stone magazine wrote in 2008 that Beck "isn't sure how one would pronounce the song's title, and can't even decipher the words anymore." Beck added, "There were definitely lyrics and they were very meaningful. I think." So no, I have no idea if ANY of my lyrics are correct. I used an "inverted" mix, which drops out a channel, to highlight the vocals better; it helped on a couple of lines maybe. Once I heard that the song title should be pronounced "Tenth Hundredth Thousandth," and I don't know if that's true or what, but it works for me.